I woke up very early today to prepare for an early flight. Upon checking in the 'United Airlines' automated kiosk, a message appeared on the screen saying that it requires a staff to clear and issue my boarding pass. The female staff informed me that aside from valid US visa, I also need to present a proof that I will be getting out of Panama. I showed her my bus ticket that will bring me to San Jose, Costa Rica after 3 days in Panama. But she insisted that I need a flight ticket. She offered a refundable return ticket worth 1,328 USD! I said to myself that it was insane! So I opened my phone and booked online via Skyscanner for a flight to San Jose worth only 150 USD (though it was not refundable). Fortunately, they agreed and issued me the boarding pass. But my flight was three hours delayed!!! 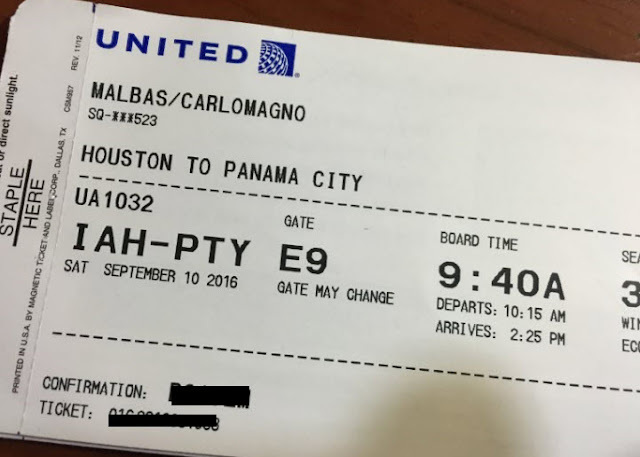 Upon arrival in Tocumen International Airport, the immigration officer asked only one question: how long am I going to stay in Panama. That's it! Well, I think I might just use the plane ticket. The bus to San Jose from Panama will take more than 12 hours against less than 2 hour flight. After a few minutes, I received a SMS from etisalat saying that they don't offer discounted data roaming pack in Panama! Wow! I really need an internet because it is easy to navigate an unknown city using GPS. So I bought a SIM card worth 30 USD with 3GB data and 20 minutes international call. I was really looking forward for a good rest after those events. But to my dismay, after I check-in to the hostel, I saw that it wasn't exactly as the same as it was advertised. The room has 8 bedspaces and I was assigned to bed number 4. There were men and women inside the room, so basically it was a mixed bedroom. They hang their towels, socks and even underwear just everywhere! And the smell of the room was not I expected. But I still gave it a try, I even took a shower in a shared bathroom (if you are one of my close friends you already know how "maarte" I am). After that very unusual shower, I tried to rest but there was no aircon, the smelly air surrounded the bed. So I opened again my phone and booked immediately a hotel. Remember, I tried to stay in that hostel but I just can't... Anyway the hotel I booked was only 5 minute walk from the hostel. I didn't even inform the hostel staff that I am changing my accomodation, I just can't face them as I was very tired and I really didn't care the for a refund. So in this new room, I will finally take a long and fulfilling rest as tomorrow will be a long day to explore Panama! Hahahahaha. I knew it. Hindi mo kakayanin ang "budget" trips. Hahahaha Ging! I tried! I really tried! I tried so hard. Lol!